[Karl Lunt] is working to slim the Raspberry Pi current draw as much as possible. The first step in his journey was to replace the linear voltage regulator with this switch mode version. It’s a step-down voltage regulator circuit with a tiny footprint and a matching price tag (about $10) made by Pololu. It’s small enough to be mounted in the empty space between the LCD ribbon connector and the main processor. The project was based on the hack we saw at the end of June. But we give much more credit to [Karl] for removing the old part in a safer way. He clipped the two small leads on the bottom of the old part, then used a beefy iron to sufficiently heat the large pad before removing the body of it. With the old part out of the way it’s just a matter of connecting the three wires in the right configuration. This cut consumption by about 50 mA. He’s hoping to do more by removing the on-board LEDs. His goal is a draw of under 250 mA in order to make it last a reasonable amount of time when running from batteries. Hope he underclocks or at least undervolts the CPU, config.txt is very helpful. Much kinder on the pads would be to use a dremel with a small cutting disc to sever the legs. I’ve buggered up pads before, trying to use cutters to do exactly this. As they squeeze out the metal from the cutting edges, they can place a lot of stress on the pads, especially if it’s only a SMD pad and not through hole. I’ve successfully used a rat-shack de-soldering iron in similar situations, while using forceps to lift the pin. When are they going to release the Model A (without the Ethernet and second USB)? That should trim down power consumption a bit (500mA vs 700 IIRC), combined with other power-saving hacks it would be pretty low-power. I’m also interested in anything that reduces power use, mainly because it also reduces heat produced and the place I want to use it the less heat the better. Unfortunately I also need a bit of processing power for image processing so I’ll probably have to do a bunch of fun with balancing that. Of course this is all waiting for the Model A; if I have to wait I might as well wait for the one I want. Is there no way to disable the ethernet to save power? It would still be less saving than the supposed model A. Or maybe try a mod and remove the usb/ethernet and hook up just one usb directly? Nice build, but seems over engineered. Even newer washing machines have a schematic inside the back panel. why not get a buzzer and a relay/timer to go off when the cycle is done? his model is probably ready for a buzzer, it was just not included as a feature. mods, please remove this and my last comment. I need to put my thoughts in the correct thread. sorry guys. I’m assuming 5V or 3.3V output is being used, and for that purpose you can get ~$4 switching regulators off Mouser that are smaller and handle up to 1.5W… I buy these by the handful for various projects with 3S Lipos + 5V electronics… seems like a good option for this sort of thing. The KIS-3R33 is even less if you order in quantity. Like $6.99 for 10x, or $9.59 for 20x – only $0.48/pc! They’re great modules. And at this price, well worth buying a pile of to have on hand for the next project. I commented in the previous related article how this module can be plugged into a breadboard, or even converted to a constant-current LED driver. Wow, those KIS-3R33S modules really are cheap! Would probably have used one for my DE0-nano mod if I’d seen them at the time. heck, even the stock LINEAR noiseLESS regulator is mounted on the very edge of the unit as far away as possible from the CPU. why? because if it’s caps opencircuit, it might oscillate… kinda like the switching one does the whole time. What exactly is is that you think the MOSFETs right next to the CPU on a typical motherboard do? they are mounted on a ground plane and the EMI/RFI is often shielded in some way. PS: extra coils… the SMPS here doesnt have large coils or caps to filter. it has small caps and i guess the (tiny) coils are underneath. means the output is loaded with noise, radio noise… i bet. … (and) (overheat(ed/ing)) capacitors are sometimes placed there so the grounded metal can acts as an RF shield, also the chip is more suseptable to RFI when the source is at an angle. im pretty sure there are ground planed inside the chip itself on a modern Pentium-4, the most sensitive circuits are deeper inside. there is also a large heatsink on modern CPU’s and the RasPI’s CPU has NO heatsink or other metal nearby. back when CPU heatsink was optional on a 386 (before Pentium-1), the CPU could get VERY glitchy VERY fast if you put high-frequency or high-powered wires right next to it. i remember having problems with IDE cables touching it. the switching power regulator in the picture for this article shows it is only an inch away, and its not perfectly next to it. it is slightly above where the EMI/RFI can “hit” it all over the entire chip. also, ive had instabilities caused by using a desktop computer with the power supply cover removed,,, as soon as you put the (main) CASE’s cover on the radio waves bounce off the main cover and into the mainboard and CPU causing it to crash within seconds. oddly enough having the main cover off allows the waves to flow out into the room, instead of to the CPU. putting the powersupply’s cover back on allowed the (main) case’s cover to be put back on without crashing. What exactly is it that you think the MOSFETs right next to the CPU on a typical motherboard do then?? 2) i want to see what happens if he glues the SMPS right to the top of the CPU for a test run of everything the PI can normally do. see if it hangs or something when doing something other then normal bootup. ie object recognition VS object recognition with SMPS glued right on the CPU. i’d say that would be the ultimate test, then isolate the TEMP vs RFI and RFI vs TEMP and see how that goes too. but thats getting a bit too much into advanced design, but nice to know. Doesn’t anyone use desolder braid any more? It makes jobs like this simple and quick with minimal risk to the board. All you need is good braid(2.5mm is handy in all situations) and a sharp blade or prying tool. Use the wick to get up the solder, then slide the blade under the edge of the leg and twist gently. If it doesnt come off with a gentle twist theres still too much solder. Its hard to imagine it working if you’ve never used it before so I will make a video as soon as possible. hot-air would be another way to remove the v-reg. Just make sure you get protection around anything plastic (I wrapped mine in tinfoil when I had to reflow the 25Mhz crystal for the smsc chip on the pi). no need to cut the legs, just heat the solder and bend one at a time. Gert, that looks like an excellent part; guess I need to make a Mouser order. The price I saw on the link was $6 for the quantities I would use, but that’s still a great deal for a fixed-output switching reg. Thanks, guys, for the tips on other options. Good comments about using solder braid and other low-injury techniques for removing the component. I’ve had good luck with the clip-and-toss method but yes, you can bung up pads if you torque the leads while cutting. If you have concerns about damaging the board with my method, the braid or heat-and-lift methods might be better choices. replacing power reg. on RasPi… a few dollars. 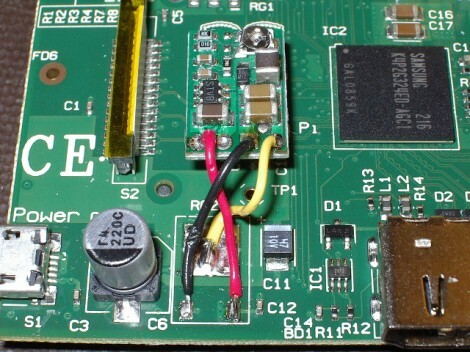 The genius of the troll who posts an article about replacing a voltage regulator on a throw-away device….God Tier troll. Any relation to Muriel? I thought this “reblogging” would have been blocked by now. Trackbacks etc are all very valid but just linking to content without any of your own input is just as bad as one of the domain sitters scamming ad revenue based on others hard work. strangely, the option IS turned off in wordpress. dunno why they keep showing up. We don’t mind reflagging though. As long as they link back to us for the story, it is actually helpful. Reblogging does not copy the whole content, but just teases people to go to the original article. There is no revenue, I am just sharing to people who follow me high quality and interesting content. Not sure what the problem with this is, IMHO it is very consistent to the spirit of hacker spaces and FLOSS.